If you buy 2 or more GumCha from our catalog, we will send you one complementary GumCha as a gift. (We’ll pick out a great design from the many we have in stock) Shipping is free (our standard shipping is through USPS and takes about 5 days), sales tax included, and your order will be much appreciated right now. As an added bonus to orders of 2 or more GumCha, each GumCha in your order will be accompanied by a card-sized 4-page brochure that introduces GumCha, the weavers, and the public health programs that the project supports. This is great for giving GumCha as a gift. Please beware – giving GumCha to friends and loved ones is a pleasantly habit-forming experience. Send a GumCha to a friend Today and help save a 2,000 year-old Tradition. 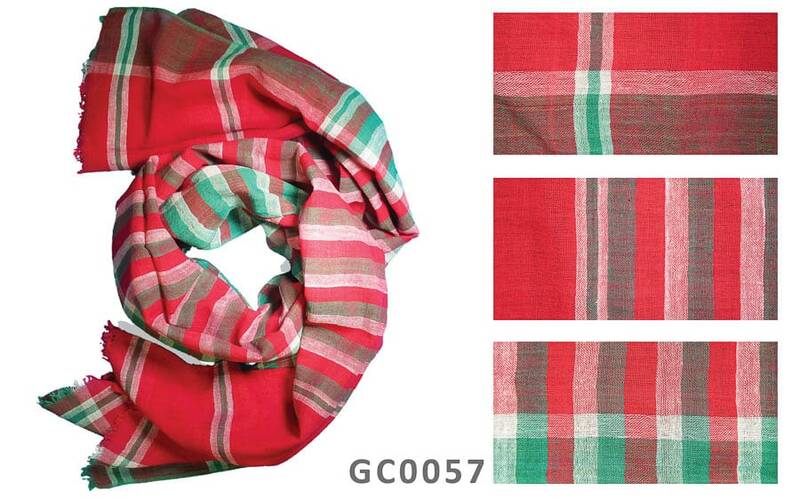 A GumCha is more than a scarf, towel, air conditioner or shawl. A handwoven GumCha has been a traditional gift in India’s rural communities since Buddha walked the trails leading through the service area of the GumCha4Health Project. There’s a special — somehow ancient — feeling when you drape a friend’s neck with a GumCha and say a few words of well wishes. It’s fun to give someone a GumCha, a “blessing in cotton,” and we think people everywhere will find it a fine and useful gift. Keeping money and jobs within the local rural economy is central to our plan. We purchase GumCha directly from weavers, not middlemen, and the processing of GumCha, their labeling and shipping to the USA are conducted by local staff in Rampurhat. Finished packages of GumCha sent from our office and shipping center located just south of Chapel Hill, NC, USA which handles sales, marketing, promotion, order fulfillment, and customer service. The GumCha4Health Project triples the income of traditional weavers AND supports health education and better access to health services for their families and communities. © 2019 Copyright by GumCha4Health - All Photos by R Growe or I Ali. All rights reserved.